Anaplasma phagocytophilum (Ap) is an obligate intracellular bacterium and the agent of human granulocytic anaplasmosis, an emerging tick-borne disease. Ap alternately infects ticks and mammals and a variety of cell types within each. Understanding the biology behind such versatile cellular parasitism may be derived through the use of tiling microarrays to establish high resolution, genome-wide transcription profiles of the organism as it infects cell lines representative of its life cycle (tick; ISE6) and pathogenesis (human; HL-60 and HMEC-1). Detailed, host cell specific transcriptional behavior was revealed. There was extensive differential Ap gene transcription between the tick (ISE6) and the human (HL-60 and HMEC-1) cell lines, with far fewer differentially transcribed genes between the human cell lines, and all disproportionately represented by membrane or surface proteins. There were Ap genes exclusively transcribed in each cell line, apparent human- and tick-specific operons and paralogs, and anti-sense transcripts that suggest novel expression regulation processes. Seven virB2 paralogs (of the bacterial type IV secretion system) showed human or tick cell dependent transcription. Previously unrecognized genes and coding sequences were identified, as were the expressed p44/msp2 (major surface proteins) paralogs (of 114 total), through elevated signal produced to the unique hypervariable region of each – 2/114 in HL-60, 3/114 in HMEC-1, and none in ISE6. Using these methods, whole genome transcription profiles can likely be generated for Ap, as well as other obligate intracellular organisms, in any host cells and for all stages of the cell infection process. Visual representation of comprehensive transcription data alongside an annotated map of the genome renders complex transcription into discernable patterns. Arthropod-borne intracellular organisms that parasitize the cells of mammalian hosts must be able to manipulate a diversity of host cells to support their own growth and life cycle. Revealing how they accomplish this will illuminate not only pathogenesis but also cell biology.Anaplasma phagocytophilum (Ap) is a gram-negative obligate intracellular bacterium, the agent of human granulocytic anaplasmosis (HGA), an emerging tick-borne disease. Ap has a 1.47 million base pair genome with 1411 annotated features . Clinically, membrane bound Ap colonies, called morulae, are seen in peripheral blood neutrophils. The white-footed mouse (Peromyscus leucopus) is considered to be the primary reservoir for the Ap variant responsible for HGA, but other mammals are also susceptible [1–4]. Ticks do not pass Ap to their offspring, but to mammals they feed upon, which transmit it back to ticks, and so the organism cycles between tick and mammalian hosts. HGA is a potentially severe illness with symptoms, including pancytopenia and limb edema, that suggest other cells or tissues, beside neutrophils, are infected [5–7] In mice, Ap infects endothelial cells  and human bone marrow cells support infection in vivo and in vitro [5, 9]. The specific cells infected in ticks have not been unambiguously identified, however evidence indicates they reside within midgut and salivary gland tissues [10–12]. Tick cell lines have been developed that support Ap replication, including ISE6, which was isolated from Ixodes scapularis, the primary vector of HGA in North America . Susceptible human cell lines include HL-60, a promyelocytic leukemia cell line that serves as a model for neutrophils, and the microvascular endothelial cell line HMEC-1 . Ap produces distinct infection phenotypes and growth kinetics in these cell lines, suggesting, along with its broad host range, that the organism adapts to each host by shifting its gene expression. The obligate intracellular lifestyle of Ap makes direct biochemical, genetic, and observational study approaches inherently difficult. Transformation of Ap with fluorescent reporters has recently been achieved and should improve visualization of live bacteria, and open avenues for directed genetic research . Nevertheless, methods for functional genomic analysis, for example, specific gene knockout, are still lacking. Gene transcription and expression analyses in animal models are largely impractical because Ap levels in tick and mammal tissues are too low for recovery of sufficient bacterial RNA or protein. In vitro studies have focused on characterization of the immunodominant p44/msp2 genes, which encode a large family of major surface proteins whose expression varies according to whether the organisms were derived from tick or mammalian host cells . In addition, genes encoding the type IV secretion system of Ap have been identified, transcriptionally analyzed, and described [17, 18], but their function and regulation remain undefined. DNA microarrays have been used to measure changes in host cell gene transcription during infection, with an aim to infer the mechanisms and strategies applied by Ap [19–24], but no microarray studies that directly measure Ap transcription have been published. The release of an annotated Ap genome sequence , and development of maskless, photolithographic, digital light processor technology (DLP)  have made it feasible to characterize global transcript levels in Ap using tiling microarrays [26, 27]. With these technologies entire genomes can be probed instead of sampling only selected sequences. The continuous data generated can be plotted in genomic order as a line graph, with transcribed genes appearing as peaks rising from a baseline of non-transcribed or intergenic sequence, and peak height corresponding to relative transcript abundance. A direct alignment of this to a parallel, annotated map of the genome can provide a visually striking and intuitive way to assess the data. Through Affymetrix (Santa Clara, CA) and NimbleGen Systems, Inc. (Madison, WI), we designed a tiling microarray for the entire genome of Ap (1.47 Mbp) and characterized Ap gene transcription in three cell lines representative of its life cycle (ISE6 tick) and pathogenesis in humans (HL-60 and HMEC-1). Sterile and Ap-infected HL-60 cells (American Type Culture Collection, Manassas, VA, USA; ATCC CCL-240) were maintained in RPMI 1640 medium supplemented with 10% fetal bovine serum (FBS) and 25 mM HEPES. Cultures infected with Ap isolate HZ were subcultured weekly by 1:50 (v/v) dilution of > 90% infected cells into sterile HL-60 cultures . The HMEC-1 cell line was received from the Centers for Disease Control (Atlanta, GA), and both sterile and infected cells likewise cultured in RPMI 1640 medium with 10% FBS and 25 mM HEPES . Infected HMEC-1 cultures were fed daily and Ap subcultured 1:50 bi-weekly when > 80% of cells were infected. HL-60 and HMEC-1 cultures were kept at 37°C in a humidified atmosphere of 5% CO2 in air. ISE6 cells were propagated in L15B300 medium with 5% tryptose phosphate broth (BD, Sparks MD, USA), 5% FBS, and 0.1% lipoprotein concentrate (MPBiomedical, Irvine CA, USA) at 34°C . Ap-infected ISE6 cultures were fed twice weekly with medium buffered to pH 7.6 using 0.25% NaHCO3 and 25 mM HEPES, and subcultured 1:50 bi-weekly . Ap strain HZ was cultured from the blood of a New York state patient by co-culture with HL-60 [Goodman et al. unpublished;  ] HZ-Ap-infected HL-60 cells (passage 8) were simultaneously inoculated into the three cell lines. These infected parallel cultures were continuously subcultured and served as the source of infected cell samples for tiling array analysis. All samples from each cell line were from Ap cultures between passages 21 and 34. Through consultation with Affymetrix (Santa Clara, CA), a library of 258,480 complimentary (perfect match) 25-mer oligonucleotide probes covering both DNA strands of the Ap genome (isolate HZ)  was designed. Each probe overlapped its neighbor by 11 bases for a probe resolution of 14 bases, the distance from the center of one probe to the next. Probes were "hard pruned" – ridden of highly repetitive sequence elements thought to be irrelevant using an algorithm (Affymetrix) to identify, somewhat subjectively, long repeat sequences. Probes for these were not included, though probes for many "shorter" repeating sequences were. Pruned sequences can be viewed easily in the Artemis graphs. They are characterized by successive data points with the same or similar value that together produce large blunt peaks. For examples see additional file 1 coordinates 665858–666184, 1025792–1026289, and 645698–646032. NimbleGen Systems, Inc. (Madison, WI) synthesized the oligonucleotide probes in situ using a photo-mediated, maskless process in which the synthesis of each probe is directed by a digital light processor . Ap genomic transcription was measured in each of the three cell lines when cultures were approximately 95% infected. Typically, cells contained hundreds of bacteria (Figure 1: Microscopic images of Giemsa stained cells infected with Ap). RNA was extracted from three Ap-infected and three uninfected samples of each cell line (18 samples total). Each sample was from a separate culture and consisted of approximately 107 infected cells or uninfected control cells. Cells were suspended by pipetting (HL-60 and ISE6) or with a cell scraper (HMEC-1) and immediately centrifuged at 300 × g for 2 minutes. The supernatant was aspirated and discarded; cell pellets were loosened by flicking and immediately dissolved in TRI REAGENT™ (Sigma, Saint Louis, MO, USA). All steps were performed at room temperature. Total RNA was then isolated according to the TRI REAGENT™ product instructions. In brief, samples in TRI REAGENT™ were extracted with chloroform and centrifuged at 12,000 × g for 15 minutes at 4°C. RNA in the aqueous, upper phase was precipitated in isopropanol, collected by centrifugation at 12,000 × g for 10 minutes at 4°C, and washed twice in cold 75% ethanol. RNA pellets were dissolved in 100 μL RNase-free water, quantified by spectrophotometry, and processed for array analysis. Preparation of tiling array "target"
Total RNA from Ap-infected or sterile control cells was processed for Ap transcript measurement according to the Affymetrix "Prokaryotic Target Preparation" protocol using random priming of total RNA to synthesize a single strand of cDNA. The cDNA was recovered by column purification, fragmented with DNase I, and end labeled with biotin. These biotinylated cDNA fragment "targets" were hybridized to the "probes" contained on the tiling arrays, labeled with a streptavidin-phycoerythrin conjugate, and probe hybridization was quantified by laser scanning. The detailed protocol was as follows. In a volume of 30 μL, 10 μg of total RNA (from Ap infected or sterile control cells) was combined with random primers (25 ng/μL final concentration) (Invitrogen, Carlsbad, CA), and, in a thermocycler, incubated 10 minutes at 70°C followed by 10 minutes at 25°C, then chilled to 4°C. To this reaction mixture was added 30 μL of the following master mix: 12 μL 5× 1st Strand Buffer, 6 μL 100 mM DTT, 3 μL 10 mM dNTPs, 1.5 μL SUPERaseIn™ (20U/μL) (Ambion, Austin TX, USA), 7.5 μL SuperScript II (200 U/μL) (Invitrogen). Samples (60 μL) were incubated in a thermocycler 10 minutes at 25°C, 60 minutes at 37°C, 60 minutes at 42°C, 10 minutes at 70°C, and chilled to 4°C. To degrade RNA, 20 μL of 1N NaOH was added to each sample, incubated at 65°C for 30 minutes, and neutralized by addition of 20 μL 1N HCl. MiniElute PCR Purification Columns (Qiagen, Valencia CA, USA) were used according to product instructions to purify cDNA from the samples. Typical cDNA yields were 3–4 μg. cDNA in 10 μL was combined with 2 μL 10× One-Phor-All Buffer (Amersham Biosciences, Piscataway, NJ), 0.6 U DNase I/μg cDNA (Amersham Biosciences), plus sufficient water for 20 μL total volume, and incubated 10 minutes at 37°C. DNase I was inactivated by heating to 98°C for 10 minutes. cDNA fragments produced were 50–200 bases in length. The GeneChip® DNA labeling kit (Affymetrix) was used as follows: 20 μL fragmented cDNA was combined with 10 μL 5× reaction buffer, 2 μL 7.5 mM GeneChip DNA labeling reagent, 2 μL terminal deoxynucleotidyl transferase, and 16 μL water and incubated at 37°C for 60 minutes. The reaction was stopped with 2 μL of 0.5 M EDTA and then frozen at -20°C until it was applied to an array. Samples were hybridized to tiling arrays and scanned at the BioMedical Genomics Center at the University of Minnesota using the Affymetrix Fluidics Station 400. Arrays were scanned using an Affymetrix Genechip 3000 scanner according to standard Affymetrix protocols. "Cel" files generated by the University of Minnesota's microarray facility were joined to Affymetrix BPMAP files specific to the tiling array using Affymetrix® Tiling Analysis Software (TAS). TAS generated a list of signal intensities and arranged them in order of genomic location and DNA strand. The data are available at the NCBI Gene Expression Omnibus (GEO) database (study #GSE11487 http://www.ncbi.nlm.nih.gov/projects/geo/query/acc.cgi?acc=GSE11487). Graphical representation of these data along with their annotations was accomplished with the JAVA based program "Artemis" http://www.sanger.ac.uk/. Using a script developed internally, the intensity plots were reformatted and imported into Artemis along with an annotation feature list http://www.ncbi.nlm.nih.gov. 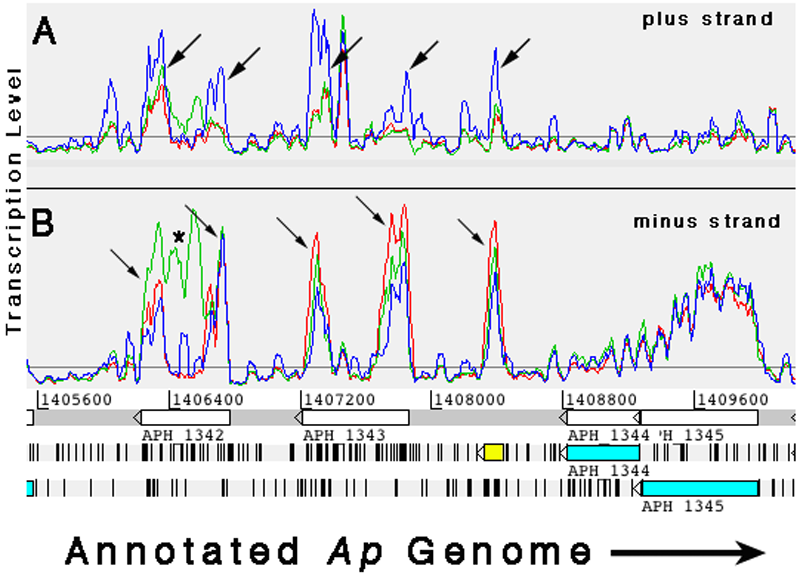 The resulting graphics give a visual overview of transcription as it relates to genomic organization, and provide clues to operon structure (see additional file 1: Artemis transcription graph of the entire, annotated Ap genome during infection of HL-60, HMEC-1, and ISE6 cell lines). The complete genome coverage provided by the overlapping probes on the tiling array translates into 90 spot intensities generated for a 1000 base open reading frame (ORF). This large number of intensities, coupled with the quality of data suggested that creating a linear graph, and measuring the area under the peaks in regions corresponding to annotated open reading frames – ORF transcription areas – would be a simple and useful method to quantify transcripts for each ORF. To compute these ORF transcription areas, the intensities were normalized via quantiles  and imported into the IgorPro data analysis program (WaveMetrics Lake Oswego OR, USA) along with the ORF and structural RNA annotations available from http://www.ncbi.nlm.nih.gov. A script was written to index a trapezoidal integration algorithm of the intensity list with the start and end genomic positions indicated on the annotation. This script operation generated a list of 1411 transcription areas. ORF transcription areas computed from the quantile normalized data (3 each for HL-60, HMEC-1 and ISE6) and paired 2 tail Students t-test, were performed on: HL-60 vs. ISE6, HMEC-1 vs. ISE6, and HL-60 vs. HMEC-1. ORF transcription area comparisons with p values ≤ 0.05 were considered significant for determination of the number and identity of genes transcribed. Determination of differentially expressed genes utilized the additional requirement that the mean ORF transcription area be at least twice the mean ORF transcription area of the same gene of the compared cell line. The number of expressed ORFs was determined by T-test comparison between the ORF transcription areas from infected cell monolayers, and those of uninfected control cell monolayers. The signal intensity of these arrays was baseline corrected using the signal intensities of twelve manually selected intergenic regions devoid of obvious signal from across the span of the genome. ORF transcription area comparisons with p values ≤ 0.05 were considered significant for determination of the number and identity of genes transcribed. Five Ap genes with known products were assayed for relative transcript abundance by qRT-PCR. Tiling data indicated that four of the genes had differential transcription patterns between the human and tick cells: major outer membrane protein (omp-1A; APH_1359), outer membrane efflux protein (APH_1110), major surface protein 4 (msp4; APH_1240), and the 60 kDa chaperonin (APH_0240). The fifth gene, which codes for succinyl-CoA synthetase beta subunit (APH_1052), was transcribed equally in all three cell lines (Figure 2; Artemis transcription profiles for five genes chosen for assay by qRT-PCR). Artemis profiles depicting the relative transcription levels of five Ap genes during infection of HL-60 (red), HMEC-1 (green), and ISE6 (blue) cells. Plots were "smoothed" by setting the sliding window average to 5. (A) Major outer membrane protein gene (omp-1A; APH_1359) transcription greater in the human cell lines compared to the tick cell line. (B) Outer membrane efflux protein (APH_1110) greater in the tick cell line compared to the human cell lines. (C) Transcription of the major surface protein 4 gene (msp4; APH_1240) only in the tick cell line. (D) Transcription of the 60 kDa chaperonin gene (groL; APH_0240) was greatest in HL-60, significantly lower in HMEC-1, and least in ISE6. (E) Equal transcription of the succinyl-CoA synthetase beta subunit gene (sucC; APH_1052) in all three cell lines. Total RNA (from portions of samples prepared for array analysis), from three separate cultures of each Ap-infected cell line (9 samples), were assayed in triplicate by qRT-PCR. To eliminate any DNA contamination, samples were DNase I treated using DNA-free™ (Ambion). DNase I was inactivated and RNA purified using RNeasy mini columns (Qiagen, Valentia, CA). mRNA from each of the five genes was reverse transcribed and amplified quantitatively with primers designed using MacVector (Cary, NC) and Netprimer (Palo Alto, CA) (see additional file 2: qRT-PCR primers). The primers were tested by conventional PCR on a Stratagene (La Jolla CA, USA) Robocycler with temperature gradient capability, using Ap strain HZ DNA as target. Formation of appropriate product sizes was verified and a single annealing temperature (60°C) and primer concentration (150 nM) suitable for all five primer pairs were determined, allowing RNA from each of the cell lines to be qRT-PCR-amplified together for best determination of relative transcript levels. Reverse transcription and subsequent quantitative PCR were performed on 100 ng of each RNA sample in 96-well plates using the Brilliant II SYBR Green 1-step qRT-PCR kit (Stratagene), and Stratagene's Mx3005P thermal cycler. To initiate the qRT-PCR, reverse transcription was allowed to proceed for 30 minutes at 50°C, followed by heat treatment for 10 minutes at 95°C to activate DNA polymerase and deactivate reverse transcriptase. cDNA was then amplified during 40 cycles of 30 seconds at 95°C, 1 minute at 60°C, and 1 minute at 72°C. Of the 1411 annotated features  in the Ap genome, 983 (69.6%) were significantly transcribed (p-value ≤ 0.05) in HL-60, 620 (43.9%) in HMEC-1, and 974 (69.0%) in ISE6, compared to negative control samples (RNA from uninfected cells). Between HL-60 and HMEC-1, 71 Ap ORFs (5%) were differentially (p-value ≤ 0.05) transcribed (see additional file 3: Ap- HL-60 vs. Ap-HMEC-1 differential transcription). Between HL-60 and ISE6, 585 Ap ORFs (41.5%) were differentially transcribed. Between HMEC-1 and ISE6, 304 Ap ORFs (21.5%) were differentially transcribed. Adding a fold change criterion of 2 or greater, only one Ap gene between Ap from HL-60 (Ap-HL-60) and Ap from HMEC-1 (Ap-HMEC-1) passed: APH_1342, one of the p44/msp2 paralogs. Between Ap-HL-60 and Ap from ISE6 (Ap-ISE6), 117 ORFs (8.5%), and between Ap-HMEC-1 and Ap-ISE6, 61 (4.3%) were at least 2-fold different (Table 1). The relatively low percentage of ORFs measured as transcribed in Ap-HMEC-1 (43.9%) was probably due to lower average signal intensity from those samples (850 vs. 2120 in HL-60). We determined this to be the result of suboptimal biotin labeling after using a particular batch of terminal transferase. A new aliquot of terminal transferase used in the preparation of one of the samples of Ap-HL-60 produced a particularly bright signal, resulting in a higher signal to noise ratio for the Ap- HL-60 data. Because of this, and because differential transcription was low between the human cell lines (compared to that between the human and tick cell lines), subsequent descriptions of differential transcription in Ap-ISE6 are based on comparisons to Ap- HL-60. Summary of differential Ap gene transcription between HL-60, HMEC-1, and ISE6. Of the 117 Ap ORFs differentially transcribed (p ≤ 0.05, ≥ two-fold difference) between the HL-60 and ISE6 cells, 76 had higher levels in HL-60 and 41 had higher levels in ISE6. The 76 Ap-HL-60 ORFs comprise 35 known and 41 hypothetical proteins (54%). All but three of the ORFs that were up-regulated in Ap-ISE6 are annotated as hypothetical (93%) (see Table 2: Genes differentially transcribed between human (HL-60) and tick (ISE6) cells). By comparison, 40% of all Ap genes are annotated as hypothetical. The amino acid sequences derived from the 117 differentially transcribed genes were analyzed using the secretomeP CBS prediction server  and the CELLO subcellular localization predictor  to determine the probable cellular location of each of the gene products – periplasm, inner or outer membrane, extracellular (secreted), or cytoplasmic. While 25% of all Ap genes products are membrane associated (non cytoplasmic), 43% of the 76 genes differentially transcribed in HL-60 cells and 46% of the 41 genes differentially transcribed in ISE6 cells code for non cytoplasmic proteins. As illustrated in Table 2, the greater a gene's differential transcription, the more likely it was to encode a membrane associated protein (i.e. differentially transcribed genes were over-represented by membrane associated proteins; see Table 2: Summary of Ap-HL-60 vs. Ap-ISE6 differential gene transcription). 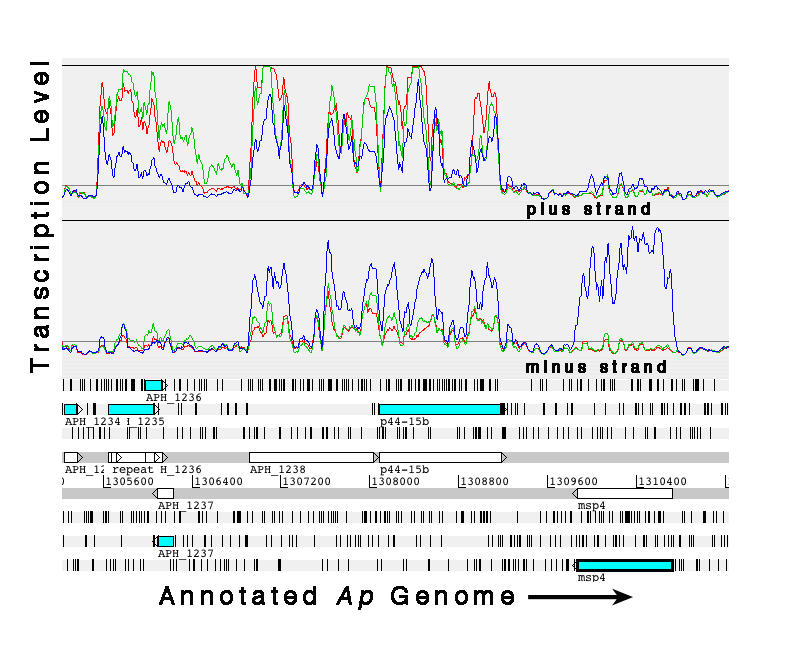 As illustrated in the Artemis transcript level graphs (see additional file 1: materials for graphing transcript level data in Artemis), when the data are displayed as linear graphs alongside a map of the annotated genome, numerous transcription behaviors are revealed. Transcribed sequences are seen to rise from the over-all flat baseline and generally correspond well to annotated ORFs. However, there are examples of transcript signal extending beyond ORF boundaries (APH_ numbers 0005, 0406, 0793, 0808, 0811, 0859, 0906, and 1151), transcription apparently not associated with an ORF (coordinates 46672–46738, 944100–944549, 692299–692983, and 1306128–1306875), and transcribed unannotated ORFs (875684–876751, 1445252–1445797 and 1241148–1241727). The ORF identified between coordinates 1241148 and 1241727 is another p44/msp2 paralog, bringing the total number of p44 loci now identified to 114 (113 were originally annotated; . Peaks and plateaus of varying profile representing gene transcription are clearly discernible. Often they slope downward from 5' to 3', but sometimes they are flat (Figure 3: Examples of flat and sloped transcription peaks). There are also numerous ORFs and operons that showed no significant transcription in any of the cell lines (see additional file 4: genes and operons with no detected transcripts). 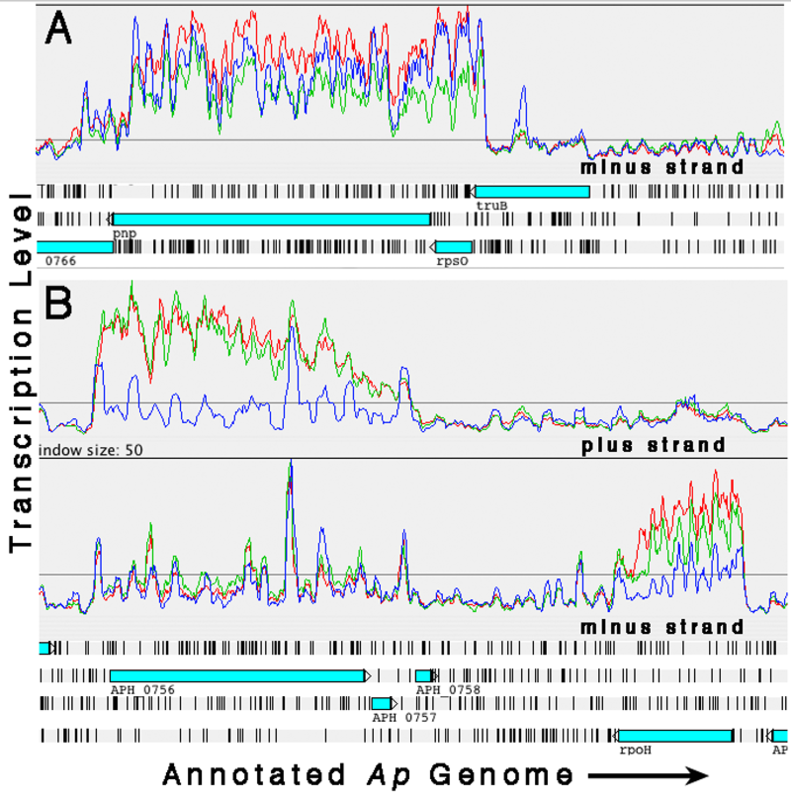 Artemis transcription plots showing examples of flat and sloped gene transcription profiles (Red: Ap-HL-60, Green: Ap-HMEC-1, Blue: Ap-ISE6; plots were "smoothed" by setting the sliding window average to 5). (A) Polynucleotide phosphorylase gene (pnp) with an over-all flat transcription profile in all three cell lines. (B) Two examples of genes – APH_0756 (hypothetical) and rpoH (heat shock sigma factor sigma 32) – with transcription profiles that slope downward from 5' to 3'. Artemis transcription plots of characteristic p44 transcription profiles (Red: Ap-HL-60, Green: Ap-HMEC-1, Blue: Ap-ISE6; plots were "smoothed" by setting the sliding window average to 5). Arrows in panel B indicate p44 conserved sequence "horns" on the coding (minus) strand, and "reflected" horns (panel A) in the anti-sense (plus) strand. A strong signal (green) associated with the HVR in APH_1342 (*), likely indicates expression of the corresponding p44 paralog (p44-31) in HMEC-1. The lack of HVR associated signal in APH_1343, but strong conserved sequence associated signals (horns), is typical of most p44 paralogs. An unannotated segment of p44 conserved sequence lies between APH_1343 and APH_1344 (yellow) on the minus strand. It also showed strong sense (B) and anti-sense (A) signals. APH_1344 and APH_1345 show typical transcription profiles: signal on the sense strand (B) but not on the anti-sense strand (A). Exceptions are p44-70, p44-71, p44-72, and p44-79, which have "conserved" ends that differ significantly from the other p44s; they produced no horns or reflections (see additional file 1, coordinates 680648–684696 and 1418814–1420199). 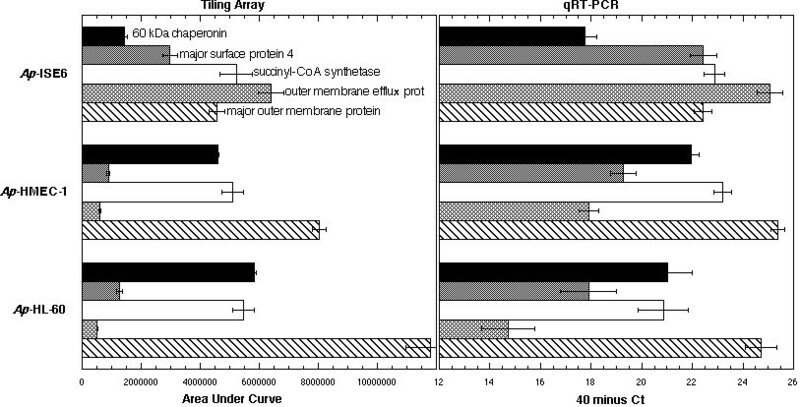 Subtler reflecting was also seen in several non-p44 ORFs, such as APH_1387, which codes for outer membrane protein HGE2 , and the hypothetical APH_0536 (Figure 5: Reflecting). 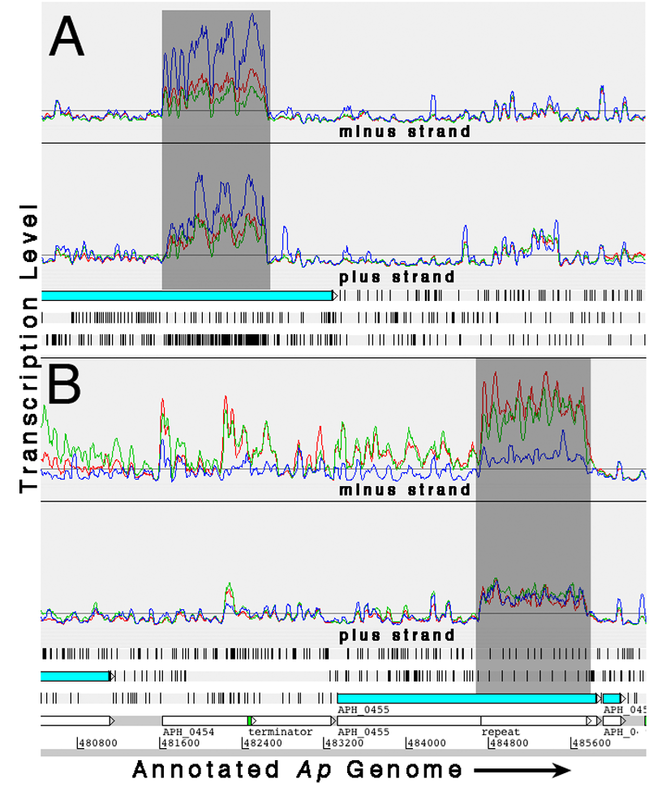 Artemis transcription plots of two genes showing "reflecting" transcription patterns on the anti-sense strands (Red: Ap-HL-60, Green: Ap-HMEC-1, Blue: Ap-ISE6; plots were "smoothed" by setting the sliding window average to 5). (A) HGE2 protein APH_1387. (B) Hypothetical protein APH 0546. Note that Ap in all three cell lines produced sense and anti-sense transcript for APH_1387 (panel A), while in the case of APH_0546 (panel B) only Ap-ISE6 produced sense and anti-sense transcript. 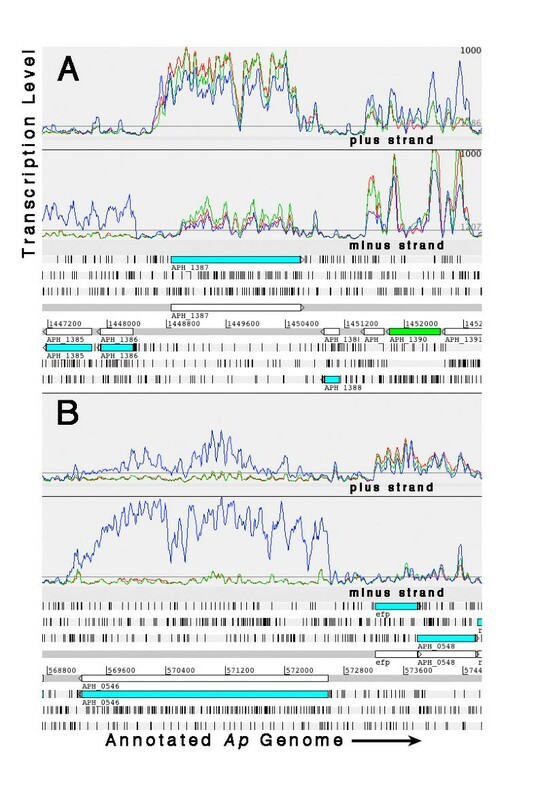 Like conserved p44 sequences, repeat sequences, which are common throughout the genome, generally displayed strong signals on both DNA strands (see additional file 5: Repeat-sequence-based sense and anti sense signal). At the p44 expression locus (APH_1221) both Ap-HL-60 and Ap- HMEC-1 showed strong transcription beginning near base 1289280, just before the start of the omp-1N gene, and continuing through the p44 expression site, while Ap-ISE6 did not. The p44 "horns" seen in Ap-ISE6 within the expression locus, are likely examples of the generalized hybridization to conserved p44 sequence noted above. The tr1 gene (APH_1218) upstream of the p44 expression locus, which encodes a putative transcription regulator , is well transcribed by Ap- ISE6 but not by Ap-HL-60 or Ap-HMEC-1. The DNA binding protein ApxR (APH_0515;  was weakly transcribed in the human cell lines but not at all in the tick cell line (Figure 6: Artemis transcription plots of the p44 expression site, and ApxR, a putative p44 transcription regulator). Artemis plots illustrating transcription activity at the p44 expression site, and at ApxR, a putative p44 transcription regulator. (Red: Ap-HL-60, Green: Ap-HMEC-1, Blue: Ap-ISE6; plots were "smoothed" by setting the sliding window average to 5). (A) In the human cell lines, Ap shows transcription beginning upstream of omp-1N (and p44-18ES, the p44 expression locus) near coordinate 1289280, but there is no specific transcription in the tick cell line. Transcription regulator tr1 (APH_1218) is not transcribed in the human cell lines but is in the tick cell line. (B) ApxR (APH_0515), a putative regulator of p44 transcription – through binding to and inhibiting the tr1 promoter – shows low-level transcription in the human cell lines but none in the tick cell line. The type IV secretion system genes identified by Hotopp et al. 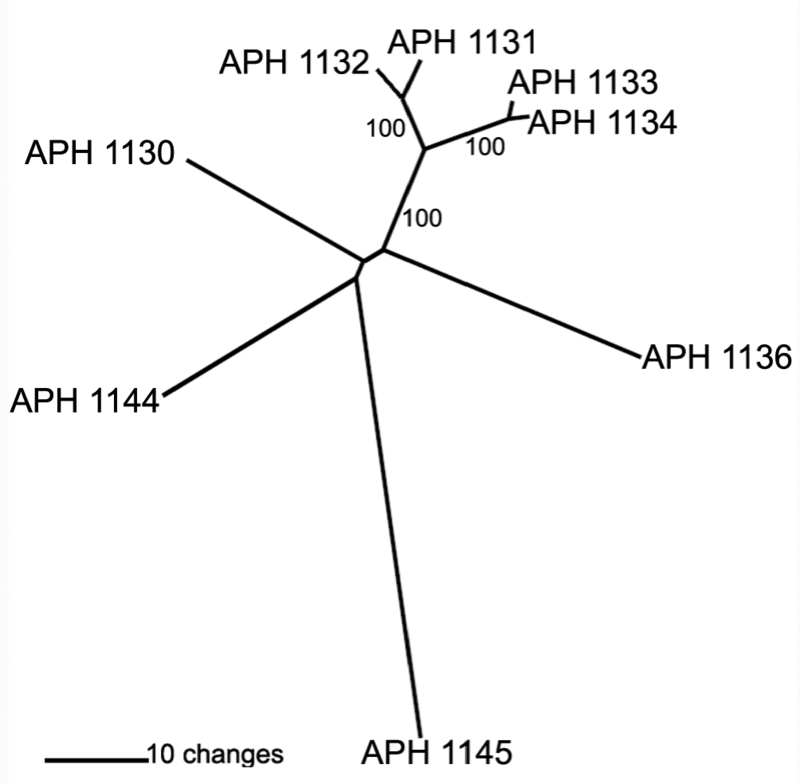 consistently showed little activity in any of the host cells, while sodB (APH_0371), an iron superoxide dismutase shown to be co-transcribed with components of the type IV secretion system of E. chaffeensis and Ap , was moderately transcribed by Ap in all three cell lines. Ank (APH_0740) was strongly transcribed in Ap-HMEC-1, somewhat less so in Ap- HL-60, and only marginally in Ap-ISE6. This Ap gene encodes a protein that is translocated to the nucleus of infected HL-60 cells [35, 36] and phosphorylated there within minutes , presumably as an effector molecule delivered via the Ap type IV secretion system . Located between genome coordinates 1194300 and 1203600 are eight paralogs of the TrbC/VirB2 gene family (pfam04956), six of which showed measurable transcript levels either only in the tick cell line (APH_1131 – APH_1134), or the human cell lines (APH_1144 and APH_1145). The relationship by amino acid sequence of these eight paralogs is illustrated in Figure 7 (Phylogenetic tree of eight virB2 paralogs by amino acid sequence), and indicates those transcribed in ISE6 are more closely related to each other than those transcribed in HL-60 and HMEC-1. Amino acid sequence alignments for the eight virB2 paralogs of Ap (see additional file 6) show identities that rank from a high of 93% between tick cell expressed paralogs APH_1133 and APH_1134, and a low of 22% between non-expressed APH_1136 and human cell expressed APH_1145. Multiple alignment showed higher identity and similarity between the C termini of paralogs, which contain the functional portion of the proteins. Phylogenetic tree showing the relationship, based on amino acid sequence, of eight virB2 paralogs in the Ap genome. Four were transcribed only in ISE6 (APH_1131 – APH_1134), and two only in HL-60 and HMEC-1 (APH_1144 and APH_1145). No transcript from APH_1130 or APH_1136 was measured. The tick cell line associated paralogs are closely related to each other, while those transcribed in the human cell lines form a separate group and are less related to each other. The tree was constructed with PAUP 4.0 using neighbor-joining: absolute variation. Values shown in branches correspond to 2000 bootstraps analysis. Two apparent tick-cell-specific operons were identified. ORFs between coordinates 1448342 and 1445170, which include locus tags APH_1386 through APH_1382, were transcribed only in the tick cell line (see additional file 7: Tick- and human-specific Ap operons). Locus tag APH_1380 appears to be part of the operon and as such was transcribed in the tick cell line, and, at a lower level in the human cell lines. The functions of the hypothetical proteins of these six ORFs are not known. However, a BLAST homology search produced E values of 9e-18 to 4e-9, indicating the six ORFs are related. The transcription profile around APH_1380 and sequence characteristics just up-stream, suggest that the ORF actually begins with the methionine at coordinate 1445107. In support of this, there is a ribosomal binding site at coordinate 1445120. This upstream area shows significant amino acid sequence homology with the N-termini of the other ORF members of this putative operon, also suggesting the sequence is part of that ORF. Between coordinates 1445252 and 1445797 an un-annotated ORF appears to be transcribed only in the tick cell line, and also shows significant homology to the other ORFs in this putative operon. If this is a true ORF, and the start of APH_1380 is extended to coordinate 1445107, the two putative ORFs APH_1381 and APH_1382 on the positive DNA strand may not be true ORFs, since they are situated opposite coding sequences in the operon and showed no transcription signal (see additional file 7 panel A). The other apparent tick specific operon includes locus tags APH_0726 through APH_0720 (see additional file 7 panel B). All but the small locus tags APH_0721 and APH_0722 were transcribed. Although these genes are also annotated as encoding hypothetical proteins, searches using SignalP  and TMHMM  prediction servers indicated they all have transmembrane domains. There was also a group of Ap genes transcribed only in the human cells: APH_0837, APH_0838, APH_0839, and APH_0842 (see additional file 7 panel C). All encode hypothetical proteins and all are related by amino acid sequence, especially APH_0838, APH_0839, and APH_0842. Relative transcript levels for the five selected Ap genes, within and between cell lines, confirm those indicated by the array data (Figure 8; Tiling vs. qRT-PCR graphs). Tiling array (area under gene curve) vs. qRT-PCR (40 minus threshold cycle) measurements of transcript levels of five Ap genes (key to bars indicated) during growth in HL-60, HMEC-1, and ISE6 cells. Relative transcript levels for the five selected Ap genes, within and between cell lines, confirm those indicated by the array data. qRT-PCR data was converted by subtracting the Ct (threshold cycle) from forty (total PCR cycles), since lower threshold cycles correspond to higher transcript levels. Total RNA from Ap infected human and tick cells was used to establish host cell specific Ap transcription profiles by hybridization to complementary oligonucleotides representing the entire genome of Ap on tiling arrays. The high percentages of genes measured as transcribed (69.6% in HL-60, 43.9% in HMEC-1, and 69.0% in ISE6), and the low levels of hybridization produced by the uninfected control samples, demonstrate that the method and array design produced sensitive, consistent, and specific transcription measurements. This is encouraging since efforts to fractionate or amplify RNA samples inevitably skew results. However, the culture samples analyzed were heavily infected and therefore optimal for such a direct approach. The three cell lines – HL-60 human promyelocytic, HMEC-1 human microvascular endothelial, and ISE6 tick – each produced bacteria with distinct transcription profiles, suggesting that Ap gene expression is closely dependent on the phenotype and genotype (species origin) of its host cell. The bacteria assayed were not synchronized, they were the result of 1:50 inoculations, and therefore the transcription profiles generated were an average, perhaps with a "late stage" bias, of the infection process in each cell line. Transcription profiles between the two human cell lines appeared similar, however with better and more consistent biotin labeling the percentage of Ap ORFs transcribed in HMEC-1 (43.9%) is predicted to be closer to that seen in HL-60 and ISE6 (~70%), and differences in transcription profiles between Ap-HL-60 and Ap-HMEC-1 would be magnified to reveal additional essential characteristics of Ap transcription in the human promyelocytic versus endothelial cells. Transcription differences between the human and tick cells were extensive; there were many genes and apparent operons transcribed in the tick cells but not in the human cells, and vice versa. The fact that the vast majority of tick cell specific transcripts are for hypothetical genes is tantalizing, and likely reflects our ignorance of the molecular patho-physiology of ticks and their associated bacteria. The observation that in all three cell lines some Ap genes and operons remained inactive, is either an indication that there are genetic capabilities not called for by these in vitro infection conditions – the particular intracellular environments of each cell line and the laboratory growth conditions – or the failure of this method to measure the transcription of those genes. Genes and operons that were truly silent may, among other possibilities, encode products specific to earlier stages of infection, to colonization of ticks following blood-meal uptake, or to parasitism of different hosts. Given the distinct transcription profiles produced between the human and tick cells, and the diversity of animal hosts and cell types infected within each, all are possible explanations. The virB2 paralogs of the type IV secretion system (T4SS) identified as differentially transcribed (6 of 8) between the human and tick cells (APH_1144 and APH_1145, and APH_1131 – APH_1134, respectively) represent host cell specific usage of type IV secretion system components. VirB2 is the major protein that makes up the T4SS pilus, and has been shown to be necessary for full virulence in Brucella abortus . In Ap, seven of the eight virB2 paralogs are annotated as being TrbC/VirB2 (pfam04956) family members on the Entrez Protein entries for each individual protein. APH_1145, although not annotated as virB2, shares homology with and is located next to the other seven. Several other bacteria within the family Anaplasmataceae also possess multiple paralogs of virB2, which is unusual, as the majority of bacteria with type IV secretion systems have only one or two virB2 genes. A blast search done with APH_1133 shows, for example, that Anaplasma marginale, as well as Ehrlichia and Wolbachia species, also have multiple loci annotated as TrbC/VirB2 family members (see additional file 8: Examples of other Anaplasmataceae bacteria with multiple virB2 loci). These bacteria might also express specific virB2 paralogs in a host cell dependent manner. The absence of p44 transcription in ISE6 at the p44 expression locus and clear transcription in HL-60 and HMEC-1, is consistent with the observation that the tick cell samples produced little or no hybridization to p44 HVRs, while the human samples did, and indicates that in ISE6 little if any transcript was generated from any of the 22 full-length p44 genes. The lack of ApxR transcript in the tick cells is consistent with the findings of Wang et al., who performed quantitative reverse transcription PCR on Ap-infected ISE6 cells and tick salivary glands and found that ApxR is not transcribed . It was suggested that ApxR generally regulates transcription in mammalian host cells and specifically regulates p44 transcription by binding to the tr1 promoter. The strong transcription of tr1 in the tick cells in this study may be due to a lack of suppression by ApxR, which is not transcribed in the tick cells. The function of tr1, therefore, is unclear. 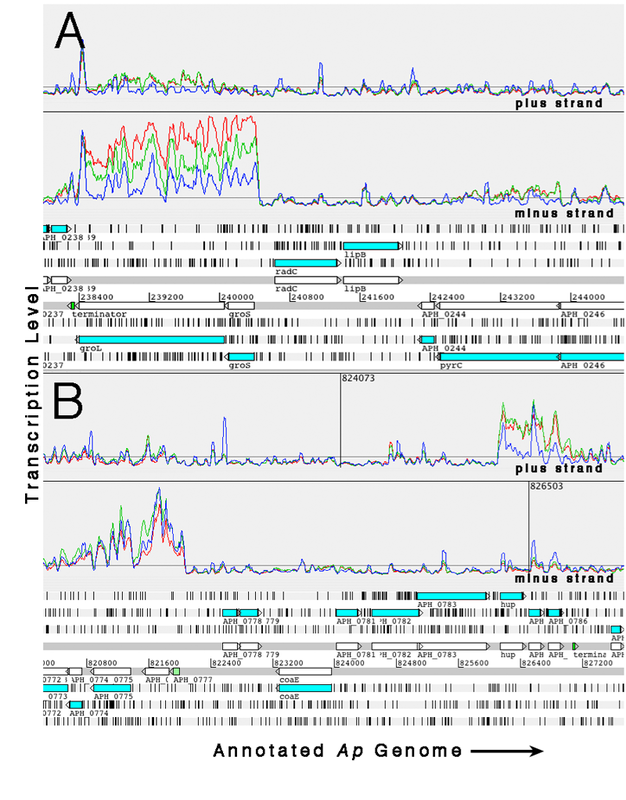 The apparent over-representation of transcript from conserved p44 sequences, along with its reflecting behavior in the anti-sense strand, is unexpected. It may be the result of transcriptional "read-through" followed by the formation of stable double stranded, conserved sequence RNA. Bacteria are known to have poor control over transcription termination, and transcription of anti-sense sequence has been identified in Mycoplasma genitalium . Since p44 paralogs are scattered throughout the genome on both DNA strands, any adjacent gene transcription that continues into sense or anti-sense p44 sequences will create "false transcripts," the conserved sequences of which are complementary. Conserved anti-sense false transcript may anneal to conserved sense "true" and false transcript to form double stranded conserved sequence RNA, which is relatively stable compared to single stranded RNA and thus would accumulate in the bacteria (Figure 9: Diagram of possible mechanism to explain the over-representation of p44 conserved sequence transcripts and their anti-sense counterparts). Sense and anti-sense p44 false transcripts could come from many of the numerous p44 paralogs, but a possible source of anti-sense p44 transcript in the tick cells is via read-through from the msp4 gene (see additional file 9: msp4 transcription), which is opposite and just downstream of p44-15b and p44-13, strongly transcribed in the tick cells, not transcribed in the human cells, and has no obvious transcription terminator. A proposed model for generation of the observed anomalous p44 conserved sequence transcripts (sense and anti-sense). "Read through" transcription of genes lying just upstream of anti-sense p44 sequence (e.g. "Gene 1" and msp4) may produce anti-sense p44 transcript, which, together with p44 sense transcript, forms double stranded RNA (dsRNA). Because the HVR sequences are not complementary they do not form dsRNA and are therefore degraded. However, the conserved, complementary sequences do form dsRNA so are stabilized, accumulate in the bacteria, and are measured as over-abundant by the arrays. It is possible that the anti-sense transcription noted in some genes, along with the prominent p44 transcription phenomena, function to regulate gene expression. In prokaryotes, cis- and trans-encoded anti-sense transcripts regulate coding sequence lying directly opposite or elsewhere in the genome, respectively . Although anti-sense mediated expression regulation mechanisms are poorly understood, some possible modes have been discussed and include: imprinting through DNA methylation, RNA processing interference, and ribosome interference [44, 45]. In the case of p44, anti-sense transcripts may serve to silence leaky expression occurring from any of the 22 identified full-length p44 paralogs , which are apparently capable of being expressed independently from the p44 expression locus . P44 silencing may be especially important in tick cells and account for the particular abundance of anomalous p44 conserved sequence transcripts in Ap-ISE6, which showed no p44 HVR transcription. Sense and anti-sense RNA homologous to the conserved ends of the p44 genes may even facilitate the process of non-reciprocal recombination by which p44 paralogs move into and out of the expression locus . If they are not purposeful, it is likely that these gene transcription phenomena are the result of poorly controlled transcription or are artifacts of the tiling arrays. The repeat sequence associated sense and anti-sense "transcripts" do appear to be an artifact of the tiling arrays, as they are consistently seen wherever repeat sequences occur, whether inside or outside of coding sequences. However, the transcription behavior of p44 is unique in the genome, and most genes do not display anti-sense transcription, therefore the over-representation of transcript to conserved p44 sequences and its reflection, and the anti-sense transcription of some genes, are intriguing and merit further investigation. Obligate intracellular pathogens like Ap control the cells they parasitize – to prevent immune attacks, divert cellular resources, and prevent host cells from apoptosing. Our understanding of tick genes is poor so it is not surprising that the up-regulated Ap genes in tick cells are nearly all "hypothetical." Matched with our limited understanding of Ap genes, the tick cell data are particularly difficult to interpret. Conversely, it makes sense that the most differentially active Ap genes in HL-60 cells are better characterized, since human cell lines have mainly been used to study the biology of Ap, and, perhaps, Ap genes evolved to interact in human cells would tend to be related to characterized effectors. It also makes sense that the differentially transcribed Ap genes in HL-60 and ISE6 are over-represented by membrane associated gene products, since survival in such disparate host cells would seem to require substantial specialization at the interface of the organism with its host cell: the bacterial membrane. The fact that a majority of Ap genes have no known function poses the greatest challenge to interpreting these data. However, some things are clear: 1. Genes differentially transcribed between the human and tick cells disproportionately represent surface proteins (~45% compared to ~25% of all proteins) (Table 2). 2. There are genes, paralogs, and operons exclusively transcribed in the tick and the human cells, some of which may encode excellent vaccine candidates. 3. The particular paralogs of the p44 family of membrane proteins (114) expressed in a population of Ap may be identified by the elevated signal produced within the HVR of each as compared to silent paralogs. 4. 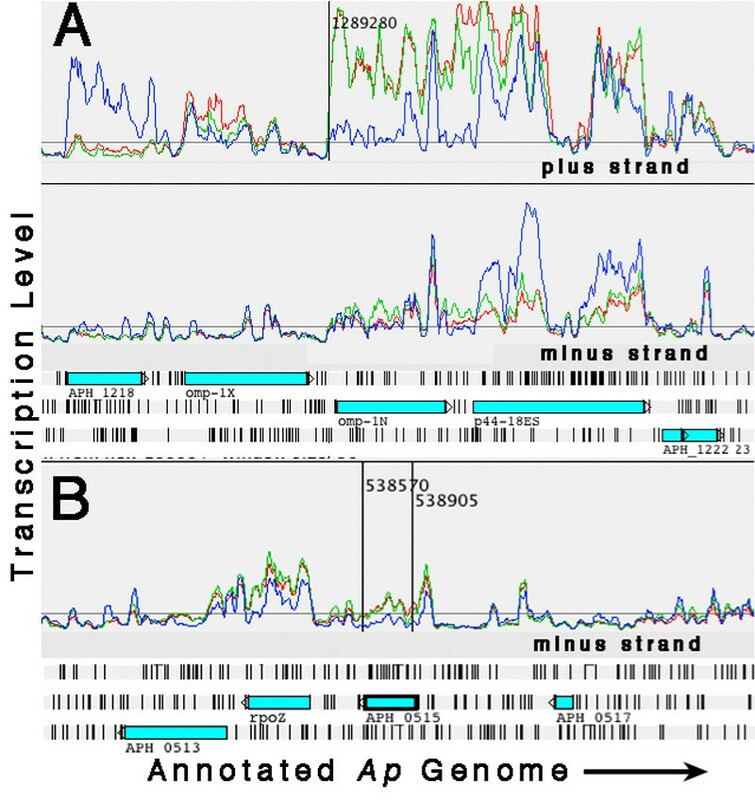 Whole RNA isolated from Ap infected host cells can be used to reveal details of bacterial gene transcription, including that from anti-sense sequences. 5. Global transcription profiles can likely be generated for Ap in any host cells, and for all aspects of the cell infection cycle – cell binding, entry, growth, and escape – although some enrichment for bacteria or bacterial mRNA may be necessary. Coupling Ap transcription data with that of infected host cells will facilitate the discovery of Ap and host cell gene functions. Having transcription data for all of an organism's DNA sequence allows a line graph display for both DNA strands parallel to an annotated map of the genome. This way one can readily see transcriptional behavior that may be less accessible through other analysis tools. For example, anti-sense transcription, and the variation in transcription profiles of genes – sloped, flat, horned, and reflected – may lead to important insights into Ap gene regulation, as well as for other intracellular organisms that subvert host cell processes for their own benefit. We thank: Wayne Xu (University of Minnesota, Super Computing Institute, University budget funded), for helping with bioinformatics issues and data interpretation; Arkady Khodursky (Biochemistry, Molecular Biology, and Biophysics, University of Minnesota), for his advice on data normalization and interpretation; and Gerald Baldridge (NIH grant Nr. AIO42792) for his help with editing the manuscript. The work presented herein was funded by a grant from the National Research Fund for Tick-Borne Diseases, Inc. to TJK, and a grant from NIH, Nr. AIO42792, to UGM. CN conceived of and carried out the tiling array study, led the array design effort, participated in data analysis, and drafted the manuscript. MH participated in the design of the study and the array, transformed the raw array data into interpretable formats, including adapting it to the Artemis annotation software, analyzed the data, and assisted in drafting the manuscript. RF participated in designing the study and the array, and assisted in the analysis and interpretation of the data, and in the preparation of the manuscript. BS performed the quantitative RT-PCR experiments. SG assisted with data analysis. AOC performed the virB2 sequence comparisons. TK and UM assisted in designing the study, the array, and in the preparation of the manuscript. All authors read and approved the final manuscript.